With a name like LionsBet, followed by the tagline ‘Kings Area’, you’d be forgiven for thinking that this betting site was a rather unwelcome one. But nothing could be further from the truth. LionsBet exudes warmth and, we hope, quality. 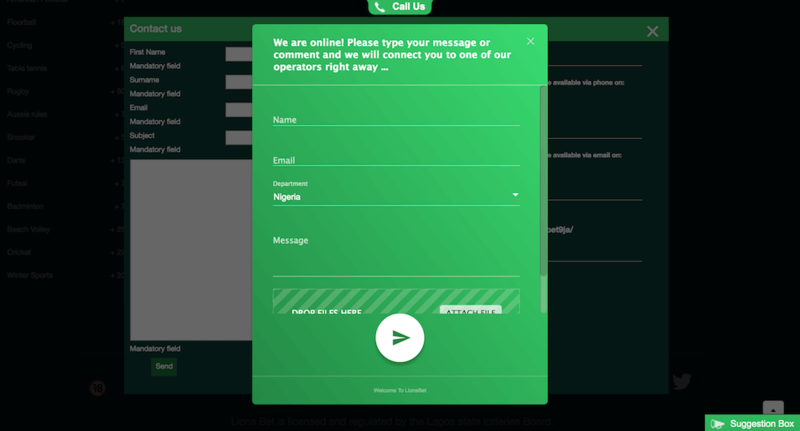 The first thing LionsBet asks you to do is tell them whether you’re from Nigeria or Zambia, so there are no prizes for guessing what countries are able to access this site. Regardless of where you hail from though, you’ll be introduced to a very attractive site with a very attractive 100% welcome bonus up to N100,000. Our criticism here would be that this is a little tucked away to the side. However, we can’t gripe about minor design flaws too much because the overall initial impression is a very good one indeed. The whole site is designed around earthy greens with a slick, easy to use interface which makes it as fun as it is stylish. Not only that but you can’t help but notice the generous amount of content available throughout. The first impressions couldn’t be much better, but we’ll find out if there’s substance to go along with this style as we take a closer look at LionsBet. We have, of course, already mentioned that all important welcome bonus, which we will get to in a second. But that’s not all that’s available promotion wise at LionsBet, as there’s a whole host of other bonus options too. Here, we’ll take a look at some but not all of them, and give a brief overview of what you can expect. Do keep in mind that the full terms and conditions can be found on the website itself. Also, while this is true for every area of the site, more than anything else, promotions are subject to change. However, we hope this quick look at some of what’s available right now should give you a good idea of the type of quality you can expect in general from the operator. 1st Deposit Bonus: As mentioned, this is a 100% bonus up to N100,000. The minimum odds here are 1.50, and the rollover requirement is 7x. This must all be completed in 30 days. It’s a quality welcome bonus, based on our initial impressions. Accumulator Bonus: You can gain a percentage bonus on accumulators of three or more, with minimum odds of 1.20. However, there doesn’t appear to be information on the actual percentages, so this one is tricky to determine. Free Bet: Unlike other free bets, which are an offer for new customers, this appears to be ongoing with free bets being rewarded. 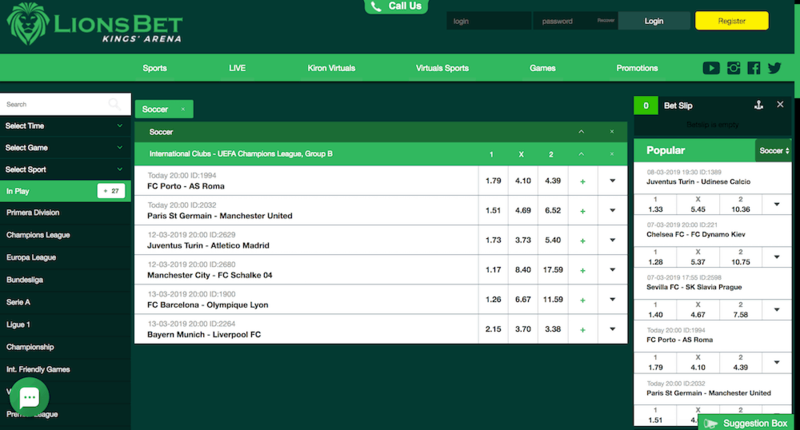 According to the extra information on the site, 20,000k will net you one free bet of N500. So, it’s a simple customer rewards scheme, essentially. While we don’t think LionsBet is going to change the betting landscape with this type of offering, it does appear to offer some additional value, although it’s a shame about the lack of information on the accumulator bonus. Another issue is that some of these promotions can be quite repetitive. For example, there are several promotions which are essentially loyalty bonuses in one guise or another. Nonetheless, they are all fairly useful – it just would be nice to see the site spread its wings a little here personality wise. 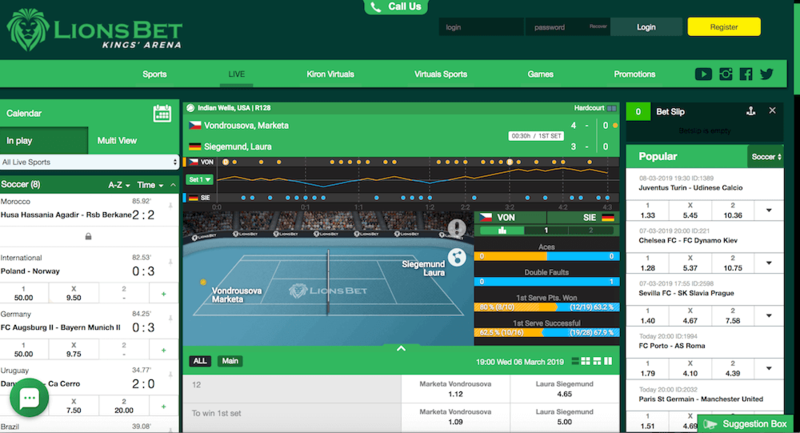 We can’t complain too much when it comes to the betting markets at LionsBet, as there’s a huge amount of sports to choose from here, as well as live betting options. Although it’s fair to say that football appears to take centre stage, with everything from the Premier League to Bundesliga being covered. On top of this, there’s also a lot of other content throughout. There are even e-sports options in the form of Counter-strike and Dota. There may be no casino at LionsBet, but they make up for that with their betting variety elsewhere. Although there is no LionsBet mobile app available, the operator does have a mobile site for those who want to wager while on the go. This is essentially a stripped-back version of the desktop site, sporting all the same design style but with a more basic layout. However, it still includes all the essentials, with access to sports, live betting, promotions and more. There is no live streaming available at Lionsbet. That being said, this is something that’s quite rare in anything other than very large betting sites. On the plus side, the site does have a healthy selection of virtuals, with a high-quality video stream of virtual football, greyhound and horse racing. Of course, a lack of casino also means a lack of a live casino. After all though, LionsBet is a sports site and it doesn’t pretend to be anything else. We’d rather it focused its attention on one area and offered a good amount of content – which it does – rather than stretch itself across multiple betting types and find parts of the site barren. In terms of the virtuals, we were very impressed with that aspect of the site. Most of the information we needed regarding deposits and withdrawals were easy to find on the site, but not all the details were available. 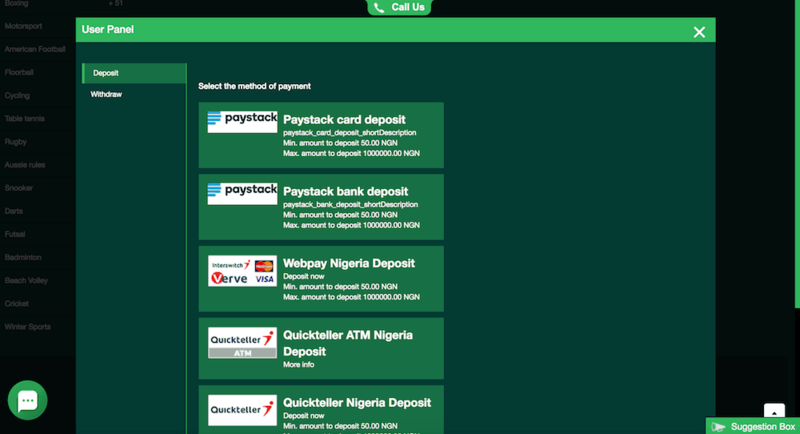 The deposit methods include Paystack card deposit, Paystack bank deposit, Webpay Nigeria Deposit, Quickteller ATM Nigeria Deposit, Quickteller Nigeria Deposit, Paydirect Nigeria Deposit and Scratch card deposit. The information for both minimum and maximum amounts was not available for Paydirect Nigeria Deposit, Quickteller ATM Nigeria Deposit or Scratch Card Deposit. Otherwise, it was N50 to N1,000,000. The only withdrawal method is bank payout, which it states includes no fees. We could find no fee information regarding deposits. The minimum withdrawal amount is N1,000 and the maximum amount is N500,000. Elsewhere, we found out that payments should take less than 10 minutes to process, according to their FAQ section. Most of the information we need is here, with the odd oversight. One key example is the lack of detail regarding what identification may be requested. All it states is they may need a means of identification to comply with relevant anti-laundering provisions. Mostly they are helpful here, but some improvements can be made. Their website states that they are licensed by the Lagos State Lotteries Board. They also state they have an SSL Web Service Certificate ensuring that all data on the site is encrypted. However, beyond this, there’s not much reliable information out there on LionsBet. This is likely because the site is fairly new – having only opened its virtual doors in 2016 – and it takes a while for a site to develop a reputation. What we have found is very mixed. meaning we can’t really make an assessment on how their customers feel about their reliability and security, as well as things like the quality of their odds. Unfortunately, beyond what is stated on their site, we can’t go into much more depth on their reputation in this regard. There are certainly areas that LionsBet can improve. Plus, because it’s a fairly new site, we couldn’t quite gauge how their customer are enjoying the operator with any degree of accuracy. That being said, we do think that there’s plenty of things to enjoy about the site. 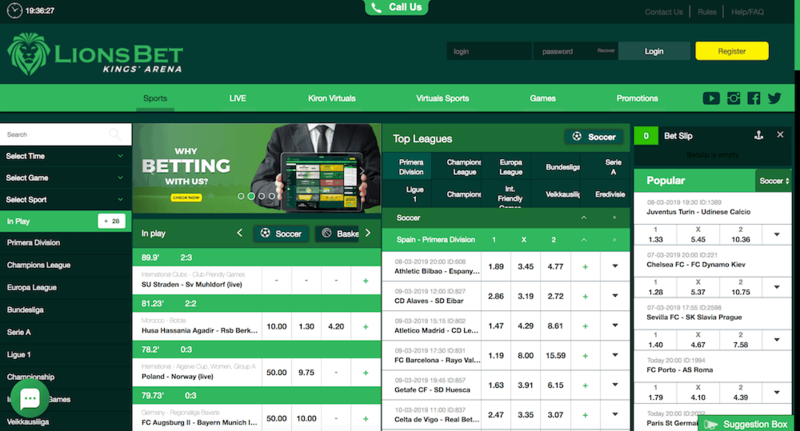 The variety on offer is an obvious one, with a wide selection of betting options and even a decent virtuals sections. Not only does LionsBet have plenty of sports to choose from, but plenty of events for the vast majority of sports it presents too. Some websites try to artificially boost the appearance of content by adding sports but few events, and that’s not a trap LionsBet falls down. It’s also an easy to use and well-designed site, both pleasing to the eye and a lot of fun. We suppose time will tell how good LionsBet is because it’s still early days right now. But it’s given us enough reasons to have hope that it will provide a good gaming experience for many.